Rudolf Gräf started at the age of 10 with Judo, 1970 he discovered das Jiu Jitsu and was gradtuated to the 2nd Dan. Inbetween he turned is attention to Do Shin Kan Karate Do / Goju Ryu Karate from 1973 until he got to know Aiki Ju Jutsu and Iaido in the style of Jigen Ryu at Harada Sensei in the beginning of the ninties.He decided to continue this way of Jiu Jitsu and met 1992 on a seminar in France Antonio Garcia Sensei and his Hakko Denshin Ryu,a Kokodo style, and so he also met Soke Irie and Shihan Ivo Belmans. Rudolf Gräf Sensei braught this new style to Austria and started to share his knowledge with the first pupils. 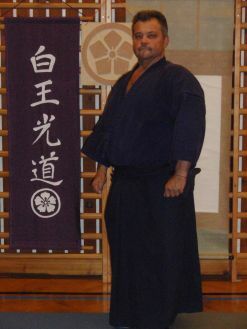 1997 Makoto Dojo became then officially the first Kokodo Ju Jutsu Dojo in Austria. 2013 graduated to Shihan by Soke Irie after an successful exam. In April 2018 Rudi graduated to Menkyo Kaiden Shihan in Omya Japan.